Better sounds, more comfort and maybe full 1080p? 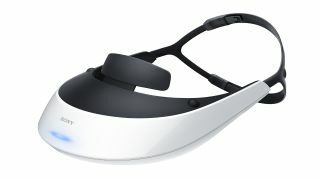 Stereoscopic 3D may divide opinion but Sony is keeping the faith at IFA 2012 with its latest 3D headset, the new and improved Sony HMZ-T2. The follow up to the Sony HMZ-T1, the new HMZ-T2 ups the ante from 720p to full-HD 1080p. At least, that's what we think. Sony isn't being quite as explicit as we'd like, simply describing the HMZ-T2 as "full HD" rather than getting into specifics with the maximum resolution. Anywho, what we can say for sure is that the dual OLED display design – one for each eye - remains. Sony says the new model is perfect for both games and movies. For movie freaks, there's a 24p True Cinema mode, while gamers get Clear Mode for smooth fast action sequences. Oh, and the new Sony HMZ-T2 is 20 per cent lighter than the outgoing model, which makes for more comfortable extended use. As before, Sony has slipped in its Virtualphones 5.1 sound tech that creates a claimed 360-degree sound stage.